(Host) A memorial was dedicated today to members of the Vermont National Guard killed in wars since September 11th, 2001. VPR’s Ross Sneyd was at the ceremony. (Sneyd) The 40th Army Band set the tone for a packed audience under a tent at National Guard headquarters. Hundreds of Guard members in their fatigues spilled out of the tent into the September sun. Vermont’s National Guard has lost 11 members in the wars in Iraq and Afghanistan, and the pain of that loss is still keenly felt at Camp Johnson. 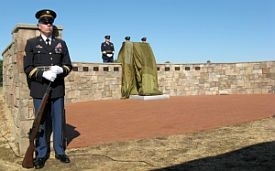 Even the Guard commander, Major General Michael Dubie, wiped away tears as he recited a Bible verse at the dedication. (Sneyd) Colonel Terry Lambert says September 11th was an appropriate date for the dedication because the terrorist attacks seven years ago led to today’s wars. (Sneyd) The Vermont National Guard Charitable Foundation took on the cause of erecting a lasting memorial to the Vermont casualties. The Foundation raised money privately to pay for the bronze and granite monument. Sound of cannon and jets. (Sneyd) The National Guard staged a full military ceremony for the memorial’s unveiling, including thundering cannon blasts for each Guardsman who died, and a flyover by the Air National Guard. The memorial sits on a grassy patch not far from Guard headquarters. A wall of red and brown stone surrounds two sculptures. 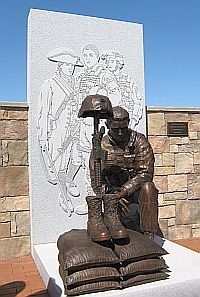 One, in bronze, depicts a soldier on his knees next to sand bags. Combat boots sit on the sand bags and a helmet sits atop a rifle, symbols of a fallen soldier. Behind the bronze is a larger granite relief sculpture with military figures from Revolutionary times to today. Eleven bronze plaques line the walls listing the name and rank of each Guardsmen who has died in the line of duty over the past seven years. The work was designed by artist Terry Jones. (Sneyd) Although the memorial is on an active military base, the public will get an opportunity to see it. Camp Johnson will be open on Saturday and Sunday between 1 and 5. Sixteen administrative staff were laid off at the University of Vermont on Friday and two varsity sports were eliminated to help balance the budget. No faculty were laid off, but the administration says contracts will not be renewed for a number of lecturers next year.